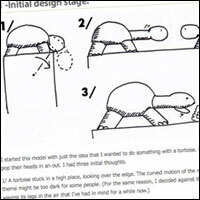 I started this model with just the idea that I wanted to do something with a tortoise. I really like the shell and the fact that they pop their heads in an out. I had three initial thoughts. 2/ Two tortoises alternately poking their heads out of their shells. 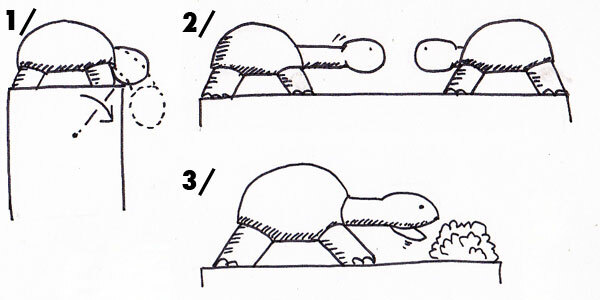 I like the idea of a mechanism where one turn of the crank moves one tortoise and the next turn moves the second one. 3/ A tortoises pokes her head out of her shell and munches on a lettuce leaf. I'd call it "A Leisurely Lunch" I have a couple of different ideas of mechanisms for this, both of which might be tricky but would be interesting to do! As I want to document this project from start to finish I've decided against these last two as well. I know from past experience that tricky mechanisms can be time consuming. 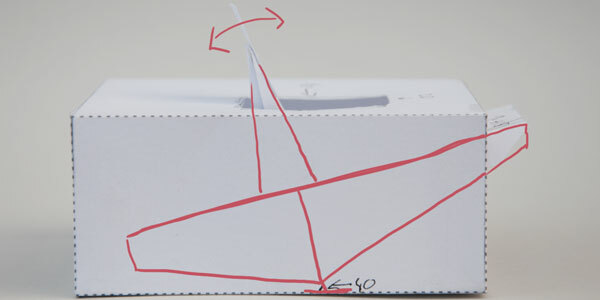 I quite often get half way through a model then put it to one side for weeks or even months while I think of an elegant solution to a tricky problem. I really want to produce a model from start to finish so I'm going for something fairly simple. In the end I've opted to produce a model where a simple press of the button on the front makes a tortoise pop out of her shell. I tend to work out most of my designs in my head. I don't often draw them out though I will cut out shapes and see how they move together. 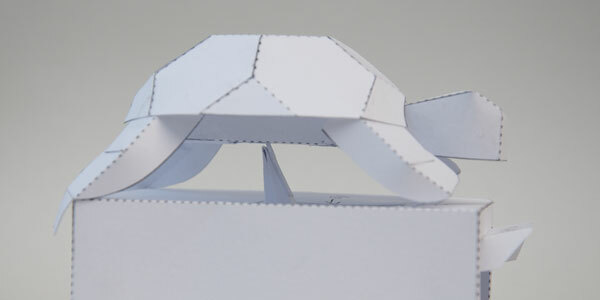 In this model, I decided to use a rocker to move the tortoise head in and out of the shell. I had in mind something like the above where the the upright piece with the double ended arrow will slot into the neck and move it back and forth. The right hand end of the rocker will act as a button, the left hand end will have a coin weight to return the button to position. I actually made the tortoise shell and tortoise first then worked out the dimensions of the box and made the test base shown here. You can see where the upright is actually too short so I've extended it by adding a length of card. I quite often do this, making small modifications to prototypes by gluing bits on or cutting bits off. Although these prototypes can be rather tatty, they're a good source of measurements for transferring part designs to the computer. The box and the tortoise fit together like this. The feet will be glued to the box top. The upright from the rocker fits into a slot in the neck. Having got all the parts of the base in the right place with appropriate holes cut and parts either extended or cut back as needed, the whole lot is then transferred to the computer. 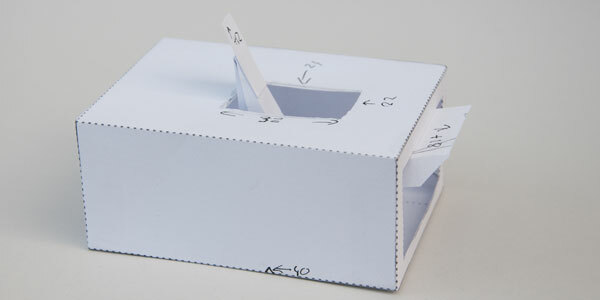 Using a ruler I go over the prototype and measure up all the bits using the model itself as a place to take notes. The next stage will be the finalisation and measurement of the tortoise parts. I started with a rectangular tube to slide the neck in and out of but having cut away loads of the tube I need to rethink the design on this part. This is so exciting, Rob! This is so exciting, Rob! I can’t thank you enough for documenting your process like this. It’s utterly amazing!